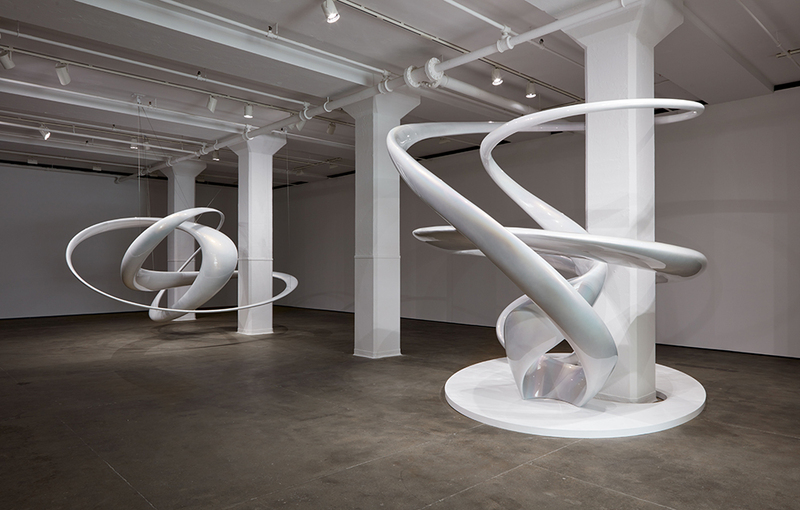 New York-based artist Mariko Mori’s nearly 30-year career has been defined by her futuristic, alien aesthetic. Her sculptures and spaces investigate our minds and the universe around us—seen and unseen. 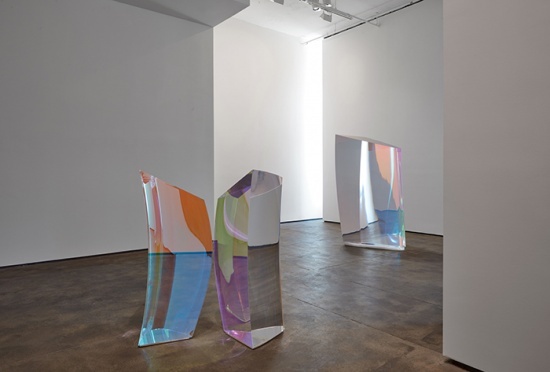 In this spirit, on display at her second exhibition with Sean Kelly in New York, Invisible Dimension, are seven space-age sculptures, produced using high-tech methods. Ekpyrotic String VI, 2016-2017. Glass fiber reinforced polymer, stainless steel. The show’s standouts are Cycloid V and Ekpyrotic String VI, installed on the ground floor. 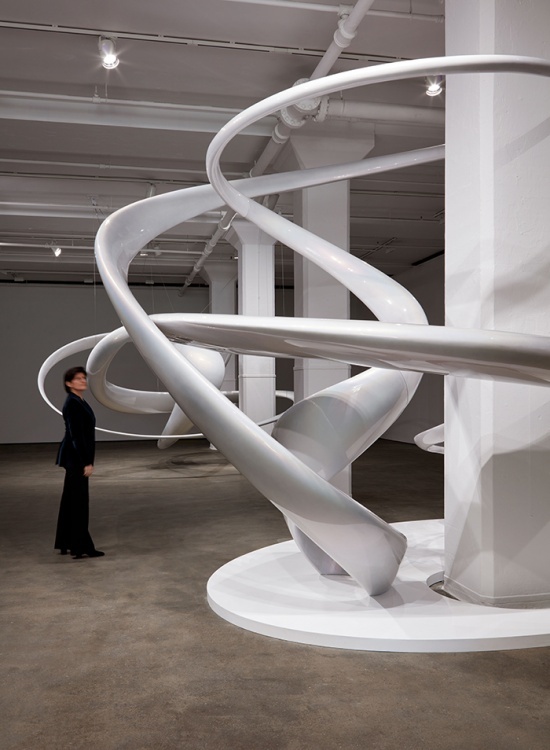 The monumental glass fiber-reinforced polymer and stainless steel sculptures fold into themselves, forming helixes of spaces-within-spaces that pull one in and engage the gallery’s architecture, playing with pillars, angles, and sight lines. The pair of sculptures, 17 feet wide at some points, are inspired by the latest innovations in astrophysics—pulling upon the theory of an “ekpyrotic universe,” the notion of an endlessly cycling formation and re-formation of universes. 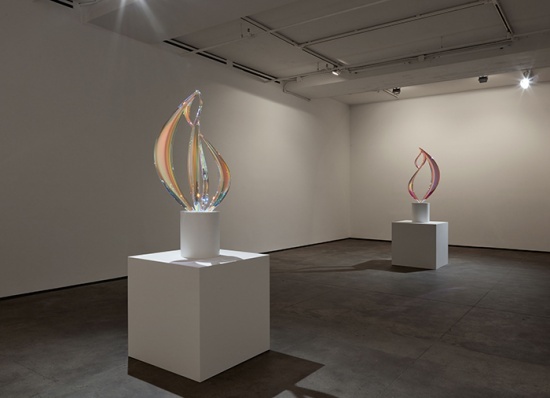 These opalescent sculptures are produced using the most technically advanced methods currently available. In collaboration with UAP, a studio known for its work in public art fabrication as well as architecture, Cycloid V and Ekpyrotic String VI were crafted with a deft combination of hand-shaping, machining, and materials know-how. Also on the ground floor, the smaller acrylic Plasma Stones envelop visitors into the sculptures’ own microcosmic environment. Appearing transparent at first, one realizes they are reflective as they pass in front of it. They appear both as physical sculptures—decidedly material—and as ethereal portals—entirely strange. Plasma Stone I and Plasma Stone II act as prisms, dispersing the full spectrum of visible light, and for Mori, they represent an inchoate, formative moment just after the universe’s creation. In the lower gallery are two smaller sculptures, Spirifer I and Spirifer II. Spirifer, a term of the artist’s own coining, refers to a deeply felt yet invisible inner spirit. As the exhibition’s title, Invisible Dimensions, might suggest, these sculptures make visible what remains unseen in nature within Mori’s own mythology. With the exception of the lone three-foot Orbicle I, all the sculptures are displayed in twos, invoking notions of pairing, entanglement, and collisions that lead to new realities—referring, for Mori, to everything from particle physics to human reproduction. 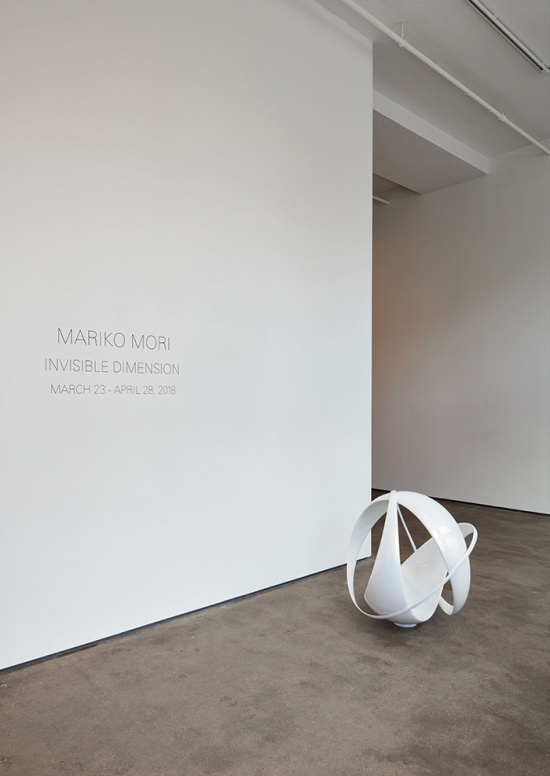 The works in Invisible Dimension are part of Mori’s ongoing inquiry into the nature of the universe—an investigation that she has often posed in not only sculptural terms, but through architectural and ecological frameworks as well. 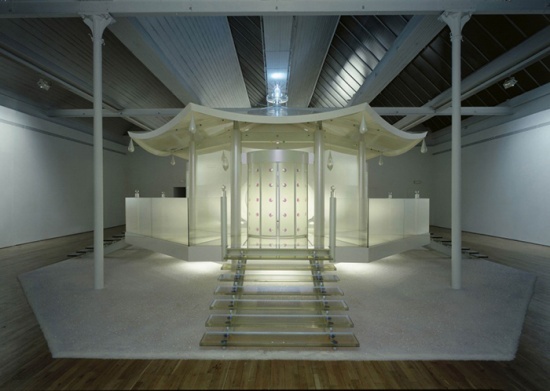 Her Dream Temple (1999) was a translucent temple built at Fondazione Prada housing a multimedia installation. Similarly, her Wave UFO (2003) was a compact space housed within a large, iridescent, alien-like lozenge that visitors could enter to see computer graphics generated by their brainwaves. In 2010, Mori founded the Faou Foundation to build site-specific installations that respond to the ecology of every continent (except Antarctica). Syncretizing the scientific and the spiritual, Mori’s artistic and existential project is to build a universe in order to better see our own.